According to the Indian Hindu traditions, the bride wears the color red. Along with the red sari (worn most parts of the country), red lehnga (worn by the Punjabi brides), it is almost necessary to wear red colored ornaments. The glass made bangles, bindi and sindoor (vermillion) are required to be red in color. Hands and feet are adorned with henna designs. Hence, red plays an important part in a traditional Hindu wedding. The African bridal wear has colors and patterns that represent their village. Traditional African patterns are vibrant, especially in traditional colors like red, yellow, black and green. The girl in the picture above is wearing a wedding dress called Youraba, A dress worn by the brides of West Africa. The dress is typically hand painted and embroidered with stone and shell embellishments. 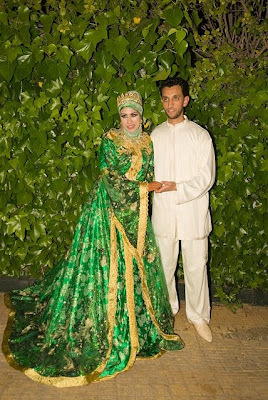 A bride from Morocco is always seen in the glorious colors of green and yellow. The color green is for the plants and also brings good luck where as the color yellow is said to drive the evil eye away. Their brides dress called a Caftan is made out of delicate laces, and often intricately beaded. The hands are painted with henna that is usually floral and geometrical designs that are meant to ward off evil spirits and bring good luck and increase fertility. The grooms name is often hidden in the henna designs. Brides from Korea are often seen wearing a lime-green Wonsam or Hwarrot worn over the traditional wedding dress, the Hanbok. The Womsam and Hwarrot are embroidered with flowers and butterflies, and banded with red, symbolizing heaven; indigo, for earth; and yellow for humanity. The bride's hands are covered in white, the symbol of respect. In a traditional Shinto style wedding, a Japanese bride wears a white silk Kimono (Iro-uchikaka) lined with red. This symbolizes happiness and a new beginning. The bright and colorful Kimono originated in the Edo era and was originally worn by court nobles. Rich in fine embroidered patterns, the uchikake is embellised with scenes of flowers, cranes, pines, flower carts or nature motifs. The bridal kimono is sometimes handed down in the family or made into futon bedding later in life. A fan is worn in the obi belt for tradition holds that the gradual widening of the open fan implies happiness and thus brings a happy future. A traditional Roman Catholic bride from Spain would wear a black gowns and lacy mantillas to show their devotion until death. Coming over to the Americans, they did not always believe white was traditional. During the Revolutionary War, some brides wore red to symbolize the independence the Colonists desired. Other brides wore purple, which represents honor and courage during the Civil War as a tribute to the dead. Hence, it proves that each nation has significant colors, for their brides. The bridal color of various nations may differ but at the end they all wish good luck for the wife to be.